In August this year, a new stained glass window was installed in the gallery above the east aisle of the Parish Church. 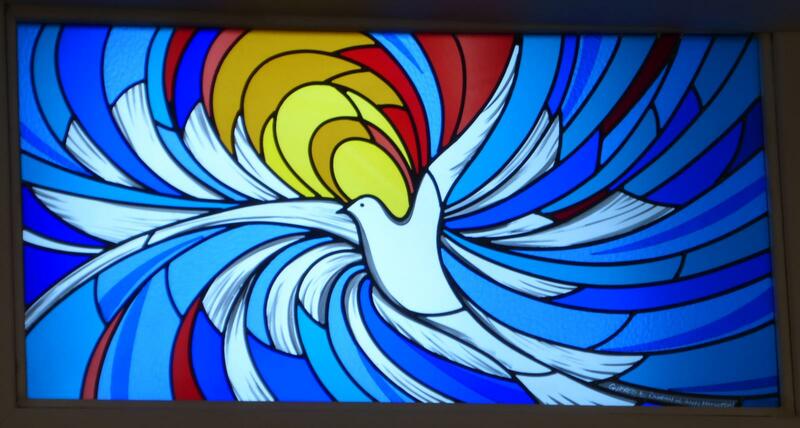 Designed by the artist Colin Stevenson and donated by Mr & Mrs Hamilton of Dullatur in celebration of their Golden Wedding Anniversary, the window takes its inspiration from the ‘Rainbow Window’ in the church vestibule and represents the Holy Spirit in the form of a dove. A colourful, powerful and welcome addition to our church, I’m sure you’ll agree! Our services on Sunday 23 November were led by Rev Alan Gibson, Head of Stewardship for the Church of Scotland. After the services he asked if he could take a photo of the congregation to post on his Facebook page. 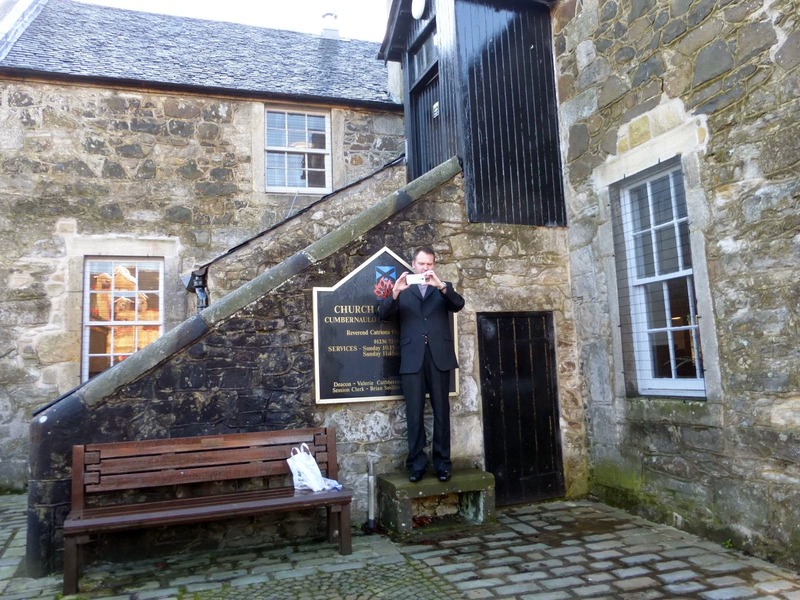 Here he is, then, taking a photo of us after worship at the Parish Church in the Village. Our annual Christmas Fair is on Saturday 29th November in the Village Hall, The Wynd. Doors are open from 10am until 12.30pm and we hope to offer a wide range of stalls, crafts and the usual tearoom. We’re sure Santa will manage to come along and there will also be lots of activities to keep the children occupied in the kidzone. We are currently looking for donations of baking, raffle and tombola prizes, knitting, soft goods, toys and games in good condition, and Deans’ shortbread for the tearoom. We’ll also be raffling our popular Festive Hampers and a chart is available at church and at the Forge for items that can be handed in. Unfortunately, due to a lack of storage, we are unable to accept any more bric-a-brac or books. We hope to see you all on Saturday 29th! The Ladies’ Group from the Village would like to say a big “Thank You” to everyone who supported their Coffee & Cake evening on Friday 7th November in aid of MacMillan Cancer Support – whether you helped by baking, donating, setting up, washing dishes and tidying up afterwards, or simply by being there. The sum raised was a wonderful £350 – so thank you all for your generosity! STOP PRESS: that sum has now risen to £417, so thanks again everyone. If you couldn’t be there but still want to donate, please speak to Christine Johnston or Margaret Cowan at church. Well done, ladies. An excellent sum raised in aid of an excellent cause. Anne Morrison and Elizabeth Snedden are looking for helpers to make simple craft items for sale at the Christmas Fayre. Please don’t be shy or think you have to be particularly creative – just bring along your enthusiasm, interest and ideas. We already have lots of lovely ingredients which will be turned into items for sale on Saturday 29th November. If you are willing to help, please come along to the Church Session House on Monday 17th November at 1.00pm. Tea and cream cakes a promise! The annual Act of Remembrance on Sunday 9 November will take place at the Village War Memorial at 10.45am, followed by Remembrance Sunday worship at approximately 11.15am in the Parish Church. This will replace our usual service at 10.15am. Remembrance Sunday worship will take place at the Forge Centre, Balloch at 11.45am.